News.com featured an article whether it is worth the extra cost going 1st Class on Euro Rail. It's a very interesting article and well worth a read. But what about Australia's rail 1st Class trains journeys. There are really two responses to this very good question as the great rail journeys of Australia which was once an interstate business orientated no longer apply as the air traffic revolution has well and truly come upon us. The Southern Aurora is no more. 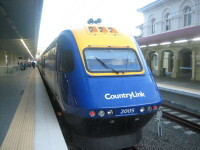 The Sydney – Melbourne – Sydney overnight express outlived its day and was cut. Business people would get a good evening meal, work in the office as it were in either the Lounge car or in their berth cabin, get a good night's sleep and be fresh for a day's work on arrival. 8.00pm depart, 9.00am arrive. There is a humorous story associated with this in the Footplate Padre's book “Tales of the Footplate” one of his 16 books of train driver's anecdotes. Through the Southern Highlands heading to Sydney early in the morning two things were happening concurrently. The cutlery and china in the dining car was shooting off the tables and smashing, and the other, sleeping berth passengers were thrown off their bunks. Apparently the train was speeding around the very sharp curves way above the speed limit – at that time 17 mph (30ks) faster than the permissible speed for those curves. When the Southern Aurora arrived in Central Station Sydney, eventually the carriages were pulled back allowing the crew to change driving ends to the rear 44 Class diesel locomotive and move off across the points into the middle track for departure to Eveleigh Locomotive Depot. By the time this had occurred, the Locomotive Inspector had arrived, climbed into the cabin, reported to the driver the complaints, and removed the “tape” (like an aircraft's black box) for professional adjudication. Eventually a letter arrived for the driver making the ascertain of his speeding, the chaos it caused and demanding his defence. The driver explained it this way. The Locomotive Inspector had taken the “tape” from the rear engine (they were in the centre track when the Inspector arrived). But he said, he was driving from the front engine and by that speedo he was not speeding. Nonetheless he noted that having been a driver for 30 years he was yet to itemise a time when the Railway Department had ever been mistaken, but neither he nor the fireman have any recollection of that second diesel passing them as clearly it was doing 17 mph faster than his front diesel. They were therefore surprised not to see it ahead of them when it arrived in Central Station so they assumed it had carried off into Sydney Harbour and therefore he claimed its salvage rights. The driver was fined 5 pounds for insolence rather than 35 pounds for speeding. Overnight sleeping berth trains run from Sydney – Brisbane – Sydney; Melbourne – Adelaide – Melbourne; the Queenslander and other Qld trains; but the main ones are the great tourist trains – The Ghan (Darwin – Adelaide - Darwin) and the Indian Pacific (Perth – Sydney – Perth). These are all 1st Class and you pay extra for both the ticket and the sleeping berth compartment. The sitting trains have a leg room difference between 1st and economy along meals but both situations cater for someone who uses their iPad or lap top or iPhone. Those issues have no relevance to whether you're travelling in a 1st Class carriage or an economy carriage. The article cited above from Euro Rail has these features of 1st Class that made the difference. The seating was much more comfortable, much more room, a power socket, magazines to read and if you travel sleeping berths, plenty of storage room, a hand basin and toilet and the food was not half bad at all. The Footplate Padre has travelled in Europe by rail 1st and economy class as he has done in Australia. When on mission, it entirely depends on the situation. If the travel timetable is such that he needs to be rested up and arrive fresh ready for ministry, then is option needs to be a sensible one.